Cloud Connect Archives - Page 3 of 3 - VIRTUALIZATION IS LIFE! VeeamON 2017 has come and gone and even though I left New Orleans on Friday afternoon, I just arrived back home…54 hours of travel, transit and delays has meant that my VeeamOFF continued longer than most! 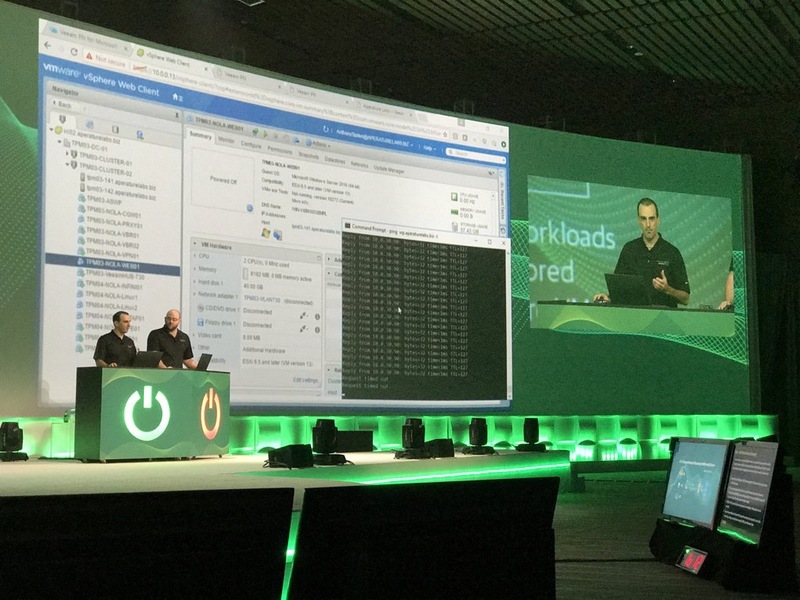 What an amazing week it was though for Veeam, our partners and our customers…The announcements that we made over the course of the event have been extremely well received and it’s clear to me that the Availability Platform vision that we first talked about last year is in full execution mode. The TPM team executed brilliantly and along with the core team and the other 300 Veeam employee’s that where in New Orleans it was great to see all the hard work pay off. The Technical Evangelist’s main stage live demo’s all went off (if not for some dodgy HDMI) without a hitch and we all felt privileged to be able to demo some of the key announcements. On a personal note, It was a career highlight to be able to present to approximately 2000 people and be part of a brand new product launch for Veeam with Veeam PN. From a networking point of view it was great to meet so many new people and put faces to Twitter handles. It was also great to see the strong Veeam Vanguard representation at the event and even though I couldn’t party with the group like previous years, it looked like they got a lot out of week, both from a Veeam technical point of view and without doubt on the social front…I was living vicariously through them as they where partying hard in New Orleans. For me, the above list shows our ongoing commitment to the Enterprise but more importantly for me working on enhancing our platform so that our Veeam Cloud and Service Providers can continue to leverage our technology to create and offer cloud based Disaster Recovery and Backup services. I have been lucky enough to work as the TPM lead on Veeam PN and I was extremely excited to be able to demo it for the first time to the world. I’ve written a blog post here that goes into some more detail around Veeam PN and if you want to view the main stage demo I’ve linked to the video in the last section…I start the demo at the 29th minute mark if you want to skip through. As mentioned above we have enhanced core capabilities in v10 when it comes to Cloud Connect Replication and Cloud Connect Backup. Obviously, the announcement that we will be supporting vCloud Director is significant and one that a lot of our Cloud and Service Providers are extremely happy with. It just makes the DRaaS experience that much more complete and when you add that to the CDP features in the core platform which will allow for sub minute RPO’s for replica’s it firmly places Cloud Connect as the market leader in Replication as a Service technologies. 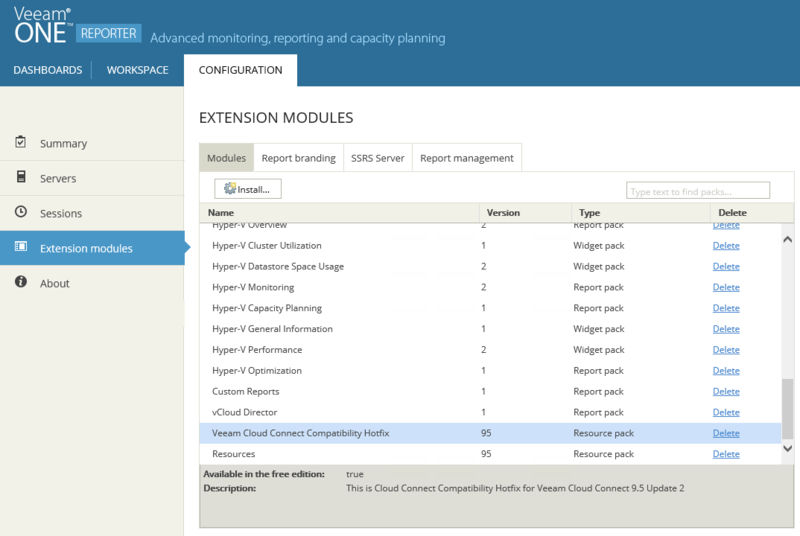 Veeam DRaaS v10 Enhancements: vCloud Director Support! We also announced backup to tape features for Cloud Connect Backup which will allow Cloud and Service Providers to offload long term backup files to cheaper storage. Note that this isn’t limited to tape if used in conjunction with a Virtual Tape Library. Hopefully our VCSP’s can create revenue generating service offerings around this feature as well. On Thursday, our R&D leads met with a select group of our top Cloud and Service Provider partners over a three hour lunch meeting which could have gone all day if time permitted. It was great to be on the other side of the fence for the first time and hear all the great feedback, advice and suggestions from the group. It’s encouraging to hear about how Veeam Backup & Replication had become the central platform for IaaS, Cloud Replication an Backup offerings and with the v10 enhancements I expect that to be even more the case moving forward. Wednesday and Thursday morning both saw main stage general sessions where we announced our new products and features along with keynotes from Sanjay Poonen and Mark Russinovich as well as co-CEO Peter McKay and co-founder Ratmir Timashev. They are worth a look and I’ve posted links to the video recordings below. Note that they are unedited and contain all change overs and wait times. Today at VeeamON 2017 we announced two very important enhancements to our DRaaS capabilities around Cloud Connect Replication and Tape Backup for our Veeam Cloud and Service Provider partners that help customer minimize the cost and reduce recovery times during a disaster. The press release can be found here, however as you could imagine I wanted to talk a little bit about the vCloud Director support. A lot of service providers have been asking us to support vCloud Director in Veeam Cloud Connect Replication and I’m very happy to write that today we announced that v10 of Backup & Replication will have support for replica’s to be replicated and brought up into at service providers vCloud Director environment. This is a significant enhancement to Cloud Connect replication end even with it being somewhat of a no brainer I am still sure it will make many VCSP people happy. 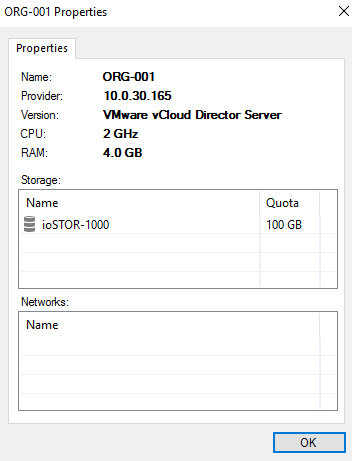 With vCloud Director support in v10 tenants can now replace existing hardware plans with vCloud Director Virtual Datacenter resources. A tenant can either leverage an existing virtual datacenter or have the service provider create a dedicated one for the purpose of replication. While Cloud Connect Replication was a strong product already with industry leading networking and ease of use, the flexibility that can be harnessed by tenants (and service providers) through the vCD platform means that there is even more control when a failover takes place. Look out for more information on our vCD integration as the v10 release gets closer…again for me, this is huge and bring’s together two of the best platforms for cloud based services even closer! VCSP Important Notice: 9.5 Update 2 RTM Is Out…With Remote Access and more! Last Friday, Veeam made available to our VCSP partners the RTM of Update 2 for Backup & Replication 9.5 (Build 9.5.0.1038). Update 2 for Backup & Replication is what we term a breaking update, meaning that if a Cloud Connect client upgrades from the 9.5 GA (9.5.0.711) or Update 1 (9.5.0.823) this will break backup or replication functionality. With that in mind the RTM has been made available for our VCSP partners to ensure it is installed and tested before being pushed out to production before the GA release. Veeam Backup & Replication releases from 8.0 (build 8.0.0.817) can write backups to a cloud repository on 9.5 Update 2, and any release from 9.0 (build 9.0.0.902) can write replicas to a cloud host on 9.5 Update 2. Update 2 is a fairly significant update and contains a number of enhancements and bug fixes with a lot of those enhancements aimed at improving the scalability of the Backup & Replication platform that VCSPs can take advantage of. The biggest and most anticipated update is for the support of the upcoming Veeam Agent for Microsoft Windows, but we also pushed out an awesome feature for our VCSPs to help manage their client or tenant Cloud Connect jobs or in fact manage their remote Veeam Backup & Replication instances with Remote Access. Below are the main VCSP related features and enhancements included in Update 2. 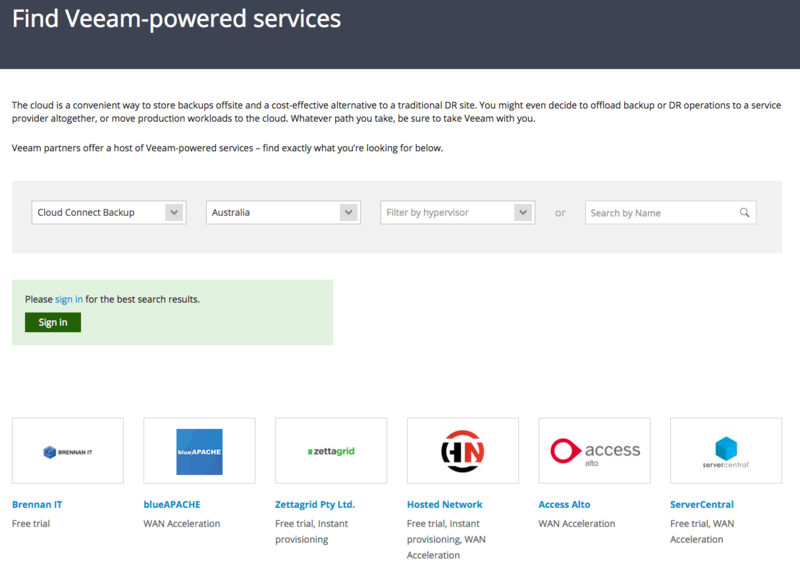 For a full list, head to the Veeam Cloud and Service Provider channels of the Veeam forum. For VCSPs with more than 300 connections there is a post regarding tweaks for improving performance at scale. Veeam Backup Remote Access: Full remote management of Veeam Backup & Replication installations at customer sites with a Veeam backup console or Microsoft RDP client over the existing Cloud Connect tunnel. Usage reporting enhancements: Usage reports are now saved in two formats, CSV and PDF. Major scalability improvements: In light of support for direct agent backups, numerous optimizations to the Cloud Connect framework on both the service provider and the tenant sides have been introduced to significantly increase its scalability (including number of concurrent tenant jobs per Cloud Connect server) and reliability large at scale. The release was tested with 1000 concurrent agent backups per single Cloud Connect instance. Reaching this number may require applying additional tweaks, please refer to this post for more information. Improved reporting and monitoring: Better visibility from the service provider side into Cloud Connect tenant jobs, including current job activity and statistics such as current rate and amount of data sent and received. Improved failback performance: Failback to the original location can now optionally leverage VMware changed block tracking information, instead of scanning the entire VM disks to determine the difference, improving failback performance up to 20 times. Hardware plan enhancements: Added the ability to increase a number of networks assigned to the Hardware Plan after it has been created. As mentioned in the VCSP forum digest this week, there is a patch available for Veeam One which enables compatibility with Veeam Backup & Replication 9.5 Update 2. This hotfix must be deployed to any Veeam ONE server that is monitoring Cloud Connect services…it doesn’t need to be installed on instances not monitoring Cloud Connect services. Once again, this is an important update to apply for VCSPs running Cloud Connect services in preparation for the GA release which will happen in about two weeks. Once released I’ll link to the VeeamKB for a detailed look at the fixes but for the moment, if you have the ability to download the update do so and have it applied to your instances. 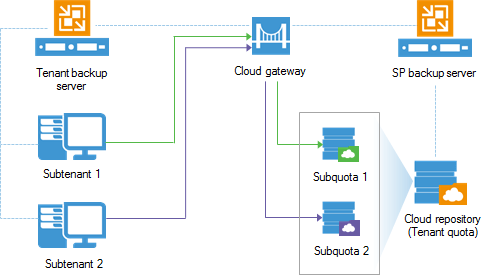 Veeam Cloud Connect Backup: What are Subtenant’s? 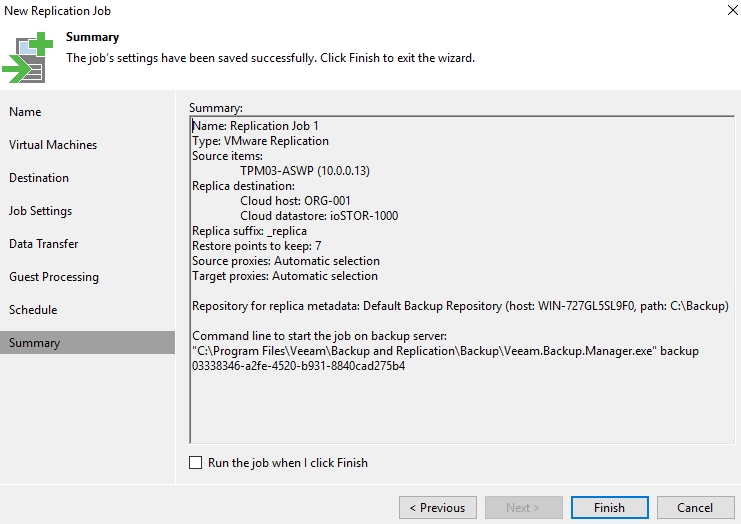 When Veeam Backup & Replication 9.5 was released, there where a lot of significant features added to enhance Veeam Cloud Connect Backup and Replication. One of the lesser known features that came out in 9.5 was the addition of Cloud Connect Subtenants. This in effect was a pre-seeded feature for our Veeam Agent for Microsoft Windows that went into public beta earlier in the year and is set to GA sometime in Q2 of 2017. 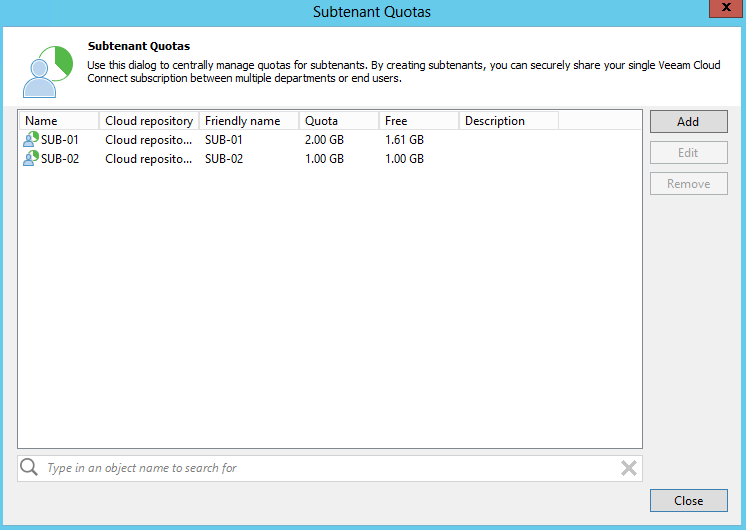 Subtenants can be configured by either the VCSP or by the tenant consuming a Cloud Connect Backup service. Subtenants are used to carve up and assign a subset of the parent tenant storage quota. This allows individual agents to authenticate against the Cloud Connect service with a unique login allowing backups to Cloud Repositories that can be managed and monitored from the Backup & Replication console. As a Veeam Cloud Service Provider offering Cloud Connect Backup services it’s important that if not done so already…start wrapping your heads around the subtenant construct and how it works with Veeam Agent for Microsoft Windows (currently in beta) as you want to be in a position to take advantage of them for when Veeam Agent for Windows does go GA.
Stay tuned to veeam.com for more blog posts around the Veeam Agent for Microsoft Windows ability to backup to Cloud Connect repositories using subtenants and also keep an eye out on my fellow team member, Clint Wyckoff’s blog cdubhub.us for some great upcoming content around all things Veeam Agent for Microsoft Windows. Yesterday (30th of March) was Veeam’s World Availability Day. This is a day that Veeam has declared to make people aware about how availability plays a part in all organizations as an extension of Backup and Replication. In it’s self, WAD is a marketing initiative from us here at Veeam that backs onto World Backup Day…which is happening today (31st of March). Veeam celebrates World Availability Day in recognition of the fact that for modern businesses and service providers, it’s not only about having backups of data anymore, it’s about being Available. Veeam helps organizations of any size and shape to achieve Availability for both their virtual and physical infrastructures, as well as provide data protection solutions in the cloud, whether private, public or hybrid. World Backup Day focuses around Backup but you can’t forget that replication plays a critical roll in organizations ensuring they are covered for disaster with low recovery times via RaaS and DraaS service offerings. Cloud Connect Replication offered by our Veeam Cloud and Service Providers offers industry leading replication platform and all Veeam customers can take advantage of Cloud Connect as it’s baked right into the core Backup & Replication product. For those not aware, Veeam has a Find a Veeam Cloud Provider Directory that lets you search for any of our listed VCSPs based on criteria that is relevant to your backup or replication needs. Reminder: Veeam and its partners are giving away $200 MILLION in Cloud services ($1,000 USD per customer)! Veeam and its VCSP partners are giving away $1,000 in FREE Cloud Services to each and every one of our +230K customers using Veeam Availability Suite, Veeam Backup & Replication and Veeam Backup Essentials. Veeam Cloud Connect Replication has been part of Veeam’s Backup & Replication product since version 9 was released in early 2016 and like Cloud Connect Backup before it, Replication is starting to get traction in the market due to it’s ease of use, intuitive interface and best of breed disaster recovery networking technologies that are all baked into the core Backup & Replication product. Without doubt one of the best/little known features of VCCR is the partial failover. Most disaster recovery scenarios focus on the total failure of all systems due to natural events or localised datacenter issues however the most common outage occurs at an virtual machine or instance level…this is generally an issue with the application or the operating system. With that, the ability to failover a single VM at a time is an often overlooked feature when looking into replication and disaster recovery platforms. Veeam provides partial failovers within Cloud Connect Replication and once a VM has a replica copied up to the cloud provider you have the ability to perform a partial failover. I’ve created a video showing the process involved to initiate a partial failover which starts the VM replica up in the cloud providers hosting platform and then creates a L2 Tunnel via Network Extension Appliances that are deployed at the production and cloud ends. For an explanation of the Network Extension Appliance click here. Without diving into the specifics of what’s happening underneath the surface the NEAs talk to each other via the Cloud Connect Gateway and bridge the layer 2 network providing layer 3 access so that the replica VM that’s been partially failed over can communicate with VMs on the production network and vice versa. This effectively means services and applications will be available over the internet without the need to employ expensive WAN connectivity mechanisms…the NEAs do all the work for you. In the demo video I am simulating the failure of a VM that hosts a WordPress site. That VM is brought up at the cloud providers end and, as can be seen in the video is shown to be running in a failed over state. From there I trigger a failback which replicates any changes made at the cloud end during the failover state back to the production site on premises. Once I am happy I commit the failback and the VM resumes normal operations on-premises. The uptake of Cloud Connect Replication through Veeam’s VCSPs has been steady and we are seeing the number of replication VM licenses reported gather pace and grow month on month. As the Backup and Disaster Recovery markets mature I fully expect Cloud Connect to be a central part of our customers 3-2-1 rule of backup and availability with Cloud Connect Replication becoming the best of breed Replication/Disaster Recovery as a Service offering in the market. Welcome to the fifth edition of the Veeam Vault and the second of 2017. It’s been a busy four or so weeks for me since the last update preparing for a number of event’s and webinar’s happening over the next month all focusing on Veeam’s Cloud Business. In this Veeam Vault I am going to talk about an exceptional new promotion that Veeam is running to help drive increased adoption of Veeam Cloud Connect, talk briefly about the ANZ VCSP Roadshow and post a round up of all Veeam Vanguard blog posts since the last update. On Valentines day we made public an amazing promotion that Veeam through it’s partners will be giving away $1000 in free cloud services to all existing veeam customers powered by the Veeam Cloud & Service Provider community. This shows just how serious we are about ensuring our customers get the most out of our availability solutions by activating Cloud Connect Backup and Replication services that are included with all Veeam Backup & Replication licenses. A few weeks in and the program has been well received and I am looking forward to this rolling out across EMEA and ANZ over the next few months. For more information about the promotion and information on Cloud Connect Backup and Cloud Connect Replication have a read of my veeam.com Blog Post here. Last week in Perth we kicked off the ANZ VCSP Roadshow for 2017…this has become an annual event hosted by Veeam ANZ and aims to encourage growth in the VCSP program by presenting to new or existing VCSP partners around Veeam’s Availability Platform that’s anchored by Cloud Connect technologies. If you are in Sydney, Melbourne, Auckland or Adelaide there is still time to register here. VeeamOn 2017 is fast approaching but Veeam is still giving away certification, tickets, flights and accomodation to this years event in May. Our latest competition is a based around our VMCE certification and if you click on the link below you will be taken to the landing page where you need to take a quiz to enter the competition. Propel your personal career by joining us in New Orleans for a training experience with cutting edge Veeam instructors and complete your VMCE certification. If you are already a VMCE, attend the brand new VMCE-Advanced: Design & Optimization v1. Take the quiz to win a fully paid trip by taking this quiz by March 20th. Climb – Smart data protection with Veeam + storage snapshots! 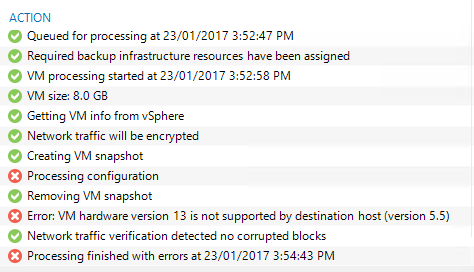 Welcome to the fourth edition of my Veeam Vault series and the first for 2017. It’s been a busy first month of 2017 with trips to Orlando where I attended my first Sales Kick Off where I also presented at our SE Training and then a trip to Russia to visit our R&D, Product and QA teams. 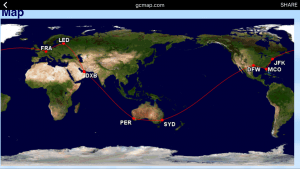 Covering nearly 42,000KMs and going literally around the world, it was a long but worthwhile trip and has me extremely enthusiastic about the year ahead here at Veeam. In this Veeam Vault I am going to talk about four new product builds that have been released since the last Veeam Vault and I’ll also talk a little about the Veeam Vanguard program…of which we announced the 2017 members overnight. As usual there will be the roundup of what the Veeam Vanguard’s have posted recently on their blogs but first i’ll talk about the new public BETA that we released on the 26th of January. I’m very excited about this product…in fact I’m excited about all of our products that take advantage of Veeam Cloud Connect and VAW is no exception. With the ability to backup physical or virtual Windows endpoints to a Cloud Connect Backup repository the door opens up for a new stream of revenue for VCSPs and in combination with the yet to be released Veeam Availability Console offer a great solution for backing up previously untouchable workloads on physical servers as well as being able to do granular file level backups of any compatible Windows workstation and back them up locally, over a network share, over to a VBR repository or up to a Cloud Connect Repository. The BETA is available via this registration page, so please download it and try it out and post any feedback in our forums. A couple of weeks ago we released Update 1 for Backup & Replication, One and Backup for Office 365. As I wrote in this post focusing on how the latest release offers support for vSphere 6.5 it was more than just a standard update and offers over 300 enhancements and bug fixes that improve on the already strong reliability and scalability of the product. Veeam One also got a significant update and added support for vSphere 6.5 and also including new Hyper-V and reporting enhancements on top of a number of resolved issues. Backup for Office 365 gets a number of enhancements and bug fixes as well and, as with all the Update 1 releases are essential downloads to continue to improve on the already strong product sets. As mentioned in the intro, Rick Vanover sent out new and renewed Vanguard’s their welcome emails overnight and this year we have 62 members at last count and as a former member of the Vanguard’s I can tell you that we, in the Technical Product Marketing team are looking forward to helping the 2017 crop get the most out of the program. I’ve blogged previously about the Vanguard program and now, with it entering it’s third year of operation I can truly say that it’s one of…if not the best vendor advocacy programs in our industry. The people involved on both sides are truly passionate about Veeam and the sense of community is something that I haven’t experienced in any other program. So well done to the 2017 class and hope to catchup with you all throughout the year are VeeamOn and any other event where we may cross paths. Jorge de la Cruz: Veeam: ¡Veeam Backup & Replication 9.5 Update 1 ya está disponible! Lastly a final reminder that the Call for Presentations is still open to those looking to submit a session at the event. This is a great opportunity to share you insights and experiences that you have gained in and around Veeam software solutions and don’t forget that if selected, presenters will receive a complimentary VeeamOn registration pass along with travel and hotel accommodations. Head to the site below to submit an abstract before February 7, 2017. VCSP Important Notice: 9.5 Update 1 Is Out…With vSphere 6.5 Support! Last Friday, we at Veeam made available for download Update 1 for Backup & Replication (Build 9.5.0.823), Veeam One (Build 9.5.0.3254) as well as for Backup for Microsoft Office 365 (Build 1.0.0.912). What was slightly unusual about this release for our VCSP partners is that there was no RTM build before GA…this is because Update 1 for Backup & Replication is what we term a non breaking update, meaning that if a Cloud Connect client upgrades from the 9.5 GA (9.5.0.711) to Update 1 (9.5.0.823) this would not break any backup or replication functionality. This does pose an interesting problem for VCSPs offering Cloud Connect Replication as it represents a situation whereby holding back on vSphere upgrades could mean that clients (who are more likely to have less roadblocks to upgrade) can’t replicate newer VMs created on 6.5 into the VCSPs Replication Cluster. The workaround is to make clients aware that only specific Hardware Versions are supported for replication however it might be expected that providers offering these services are not bound by these limitations. This becomes an architectural/business discussion around separating IaaS vCenter’s from Replication vCenter’s …but that is a topic for another day. For the moment, regardless of your underlying vSphere versions it’s worth planning the upgrade to Veeam Backup & Replication 9.5 Update 1 as soon as possible as it contains a number of enhancements beyond the ones listed above and some minor fixes for Cloud Connect. For a full list check out the release notes below and download the update here. Since Backup and Replication 7 Veeam have continued to develop new features in enhancements to support their Cloud and Service Provider community. This started with vCloud Director support…continued with Cloud Connect Backup in v8 and more recently with Cloud Connect Replication in the v9 release. Veeam Backup and Replication 9.5 was released a couple of weeks ago and with it came a bunch of new features and enhancements that VCSPs can take advantage of. Moving on from the core enhancements, without question my favourite new Cloud and Service Provider feature in 9.5 is the introductions of the vCloud Director Self Service Tenant Portal. I’ve blogged about that in preview here, and without going into too much detail in this post, Veeam saw the need to increase efficiency for VCSPs by empowering their vCloud Director tenants with a self service backup and restore portal based on Veeam Backup Enterprise Manager. Native vCloud Authentication and Integrated Access: Allows tenants to continue to use their existing vCloud Director credentials for the self service portal and restricts them from being able to backup and restore only the VMs belonging to their respective organizations. Just as a reminder this feature required Enterprise Plus to access the vCloud Director self service portal and I will be writing a more in depth blog post on this over the next few weeks. With regards to Cloud Connect, 9.5 has added improvements for both the Cloud Service Providers and their tenants with the biggest enhancement again adding to the scalability of the service by adding parallel processing for both Backup and Replication jobs. We have also extended support for key v9 features such as Per-VM backup chains, Scale Out Backup Repositories and ReFS. Per-VM backup file chains: Cloud repositories can now be backed by backup repositories with the per-VM backup file chains setting enabled to improve scalability and better support for deduplicating storage appliances. Scale-out Backup Repository: Cloud repositories can now be backed by scale-out backup repositories to simplify backup storage management and save costs for service providers. Advanced ReFS Integration: Cloud repositories backed by backup repositories meeting the requirements for Advanced ReFS Integration fully support the corresponding functionality. Parallel Processing: Tenants can now backup or replicate multiple VMs and disks in parallel, based on the concurrent task limit set by the service provider, thus improving job performance on fast links. Please note that parallel processing applies to direct transport mode only meaning that WAN accelerators are not supported. Replication From Backup In A Cloud Repository. Tenants can now perform replication from a backup residing in a cloud repository, enabling a new DR option without generating additional network traffic or impacting production VMs. Security enhancements: Veeam Cloud Connect service will now attempt to use more secure TLS 1.2 and TLS 1.1 authentication algorithms when establishing a connection to the service provider. Failover to SSL 3.0 has been disabled for all Veeam Cloud Connect components. Configuration Backup To Cloud Repository: Added support for performing configuration backups to a cloud repository, except for those backed by a scale out repository.